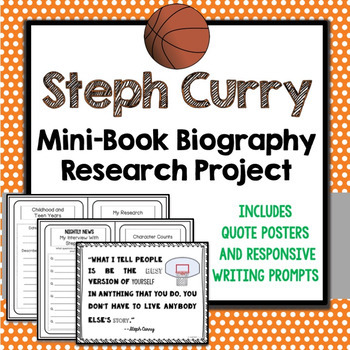 This engaging Steph Curry printable biography mini-book will get your students thinking not only about stats and scores, but about what it really takes to be successful and achieve one's goals. Easy to use, it's the perfect tool to encourage a wide range of thinking and creativity among students. 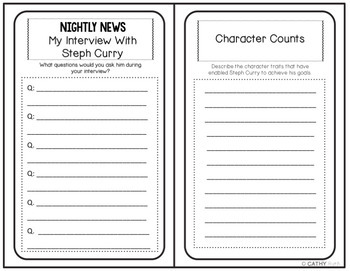 Explore character traits, mock interview questions, influential figures, and the formational years that led to Steph Curry's present achievements. 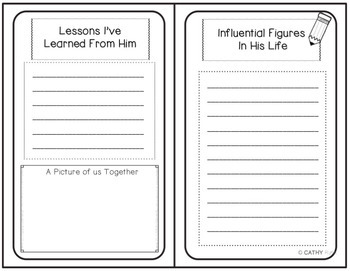 Students also will write about their personal impact after their research. 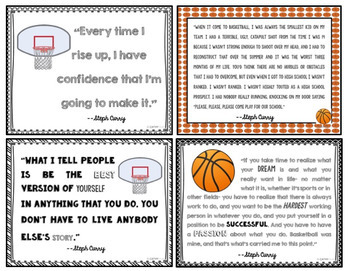 The quote posters come with several writing prompts to encourage personal reflection, such as a letter to Steph Curry. Each mini-book comes with a printable cover and is three pages, folded as a book. --Do I Agree With This Quote? --What Does This Quote Mean To Me? I truly appreciate your feedback on my products! After you download, I'd love if you could visit the My Purchases tab and rate this product. Your comments will earn you valuable TpT points to use toward your future purchases! Also, follow my store and you'll be the first to know about new products, updates, and freebies!